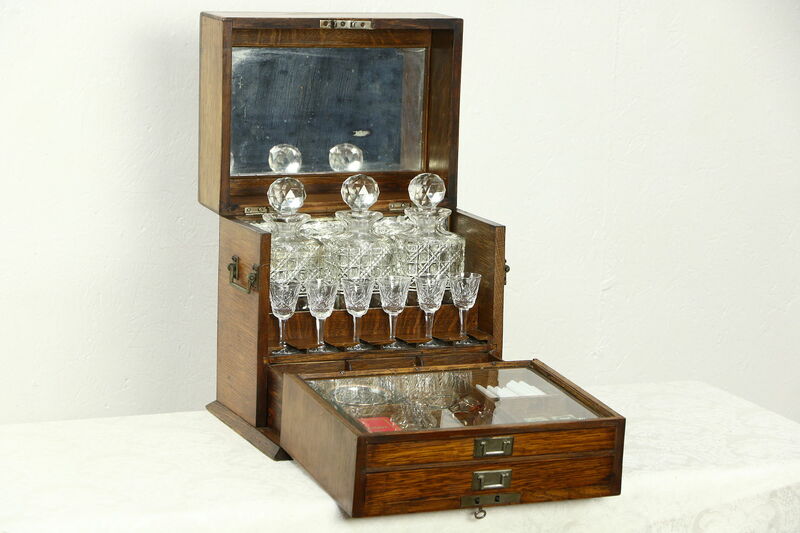 A splendid English oak portable bar cabinet from about 1900 unlocks and flips open, revealing velvet lined compartments, divided drawers, a beveled glass serving area, three cut crystal decanters and six later signed Waterford cordial goblets. The fine grained oak case has a good old finish, the lock and key work. There are minor flakes on the decanters, which have ground and fitted stoppers. The brass presentation plaque on top was not engraved, but could be. Nice for a Downton Abbey style picnic, size is 14 1/2" wide, 11 1/2" deep and 14 1/2" tall.